Hubble has snapped a spectacular view of M66, the largest "player" of the Leo Triplet, and a galaxy with an unusual anatomy: it displays asymmetric spiral arms and an apparently displaced core. The peculiar anatomy is most likely caused by the gravitational pull of the other two members of the trio. 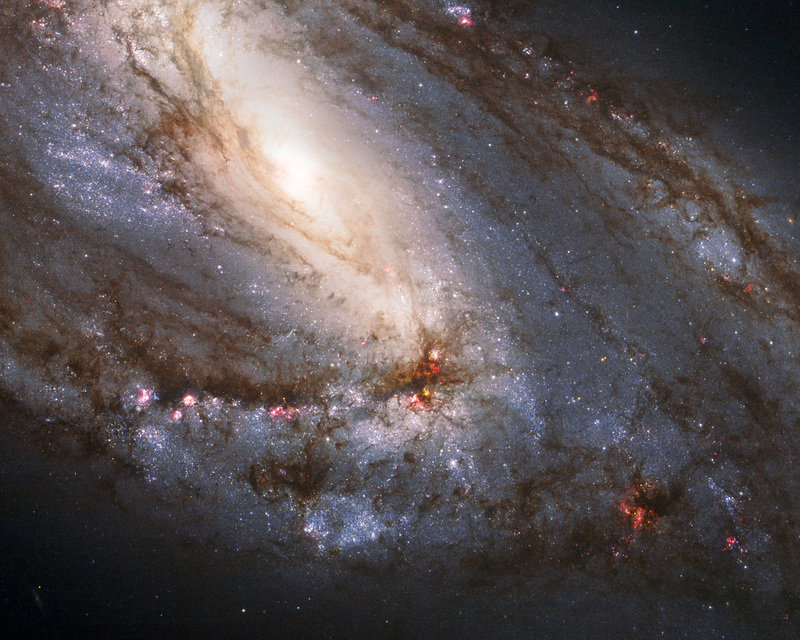 The unusual spiral galaxy, Messier 66, is located at a distance of about 35 million light-years in the constellation of Leo. Together with Messier 65 and NGC 3628, Messier 66 is member of the Leo Triplet, a trio of interacting spiral galaxies, part of the larger Messier 66 group. Messier 66 wins in size over its fellow triplets - it is about 100 000 light-years across. This is a composite of images obtained through the following filters: 814W (near infrared), 555W (green) and H-alpha (showing the glowing of the hydrogen gas). They have been combined so to represent the real colours of the galaxy.